Eat Well in New Orleans. Sweetly savory, a New Orleans day turns from pink to well done as dawn proceeds to the depths of evening. New Orleans is a gas. Struggles are muffled, bygones are forgotten, the alligator lies down with the lamb. You may not see a unicorn but plenty of fables come true in New Orleans every time the sun goes down or the moon comes up. Painting in our lobby at La Belle Esplanade. No one has ever accused New Orleans of being all creampuffs and daisies. Founded in 1718, New Orleans is a state of mind. Next to nothing, this is something. 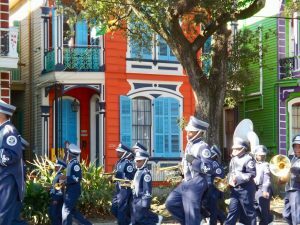 Catch the spirit of New Orleans: it’s revolutionary. So far. So good. New Orleans is a meaty city, fully fleshed, well-muscled and marbled like a good thick steak. Take a bite and get a mouthful. Like marriage, New Orleans is a tender trap. Expect little in New Orleans and you’ll get more than you’ll have bargained for. History bestows on civilizations the cities they deserve. In our time, the world could a little more New Orleans. Even Hurricane Katrina couldn’t keep this good city down. Florida is named for flowers. Louisiana is named after kings. New Orleanians are existential royalty, lords and ladies of a world they never made, one that they inherited. There is a Bourbon dynasty. There is justice in this world. To the victors go the spoils. New Orleans is a meaty city. If you want to go to an old-school steakhouse in New Orleans to have a meal you’ll never forget, we know the perfect place to recommend. It’s just around the corner from our address. We also know the best French restaurant in the city. It, too, is just a picturesque stroll from our front door. Welcome to real New Orleans. Visit like you belong here. Sunday, April 14, 2019: Frau Schmitt and I have eaten at over 600 restaurants in New Orleans. We’ve done a lot of other things besides eat over the course of our lives in this wonderful city we call home. We love to share what it is like to live here. New Orleans is more than you expect. Read our reviews on TripAdvisor. 628 people can’t be wrong. When you are ready, make a reservation to stay with us to thoroughly explore New Orleans from every angle. We live in a kaleidoscope of a city. You’ll see. Every day and in every way, good memories are made on our street.